This video demonstrates the behavior of water molecules under different circumstances that affect their structure and molecular bonds. A glass of water is poured through a paper towel into a second glass; find out what happens when the second glass is tightly covered by the same paper towel and then held upside down!. 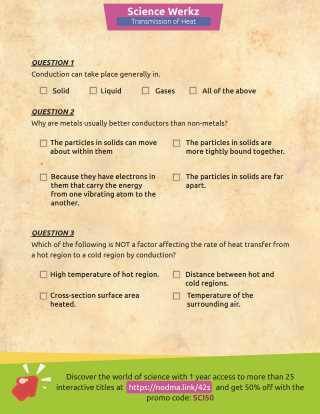 This resource from Science Werkz: Introduction to Science interactive courseware is brought to you by Nodma. ScienceWerkz is the winner of the 2013 EDDIE Award for Science E-Learning Solutions in the Upper Elementary and Middle School categories. Consisting of more than 25 courseware titles that feature informative videos, animations, checkpoints, main points, concept maps, diagrams, summary questions, and interactives to encourage critical-thinking, ScienceWerkz promotes critical thinking skills while covering core topics in General Science, Chemistry, Earth Science, Life Science/Biology, and Physical Science. ScienceWerkz offline interactive educational science solutions may be accessed on the phones, tablets, or computers. The subscription-based science apps may be used by educators for classroom learning or by parents and students for self-paced learning at home. See more engaging interactive resources from Nodma!